This is one of those amazing recipes that you can eat all. the. TIME. It’s packed with insane flavor, loaded with veggies, and takes just 30 itty bitty minutes to make. My posting schedule has been a little off this week, but like any tenured millennial I’m armed with excuses. Currently I’m en route to Whistler for a week of skiing – Dave’s bday! – so obviously I’m running into 12 million technical issues to ruin my fun. Are my photos uploading from my camera? No. Is my wifi connecting? No. Am I ready to douse my laptop in gasoline? Yes. So apologies in advance for deviating from our usual M-W-F routine – It’s temporary, I promise! But regardless of my imaginary “problems”, this recipe is here to kill it. 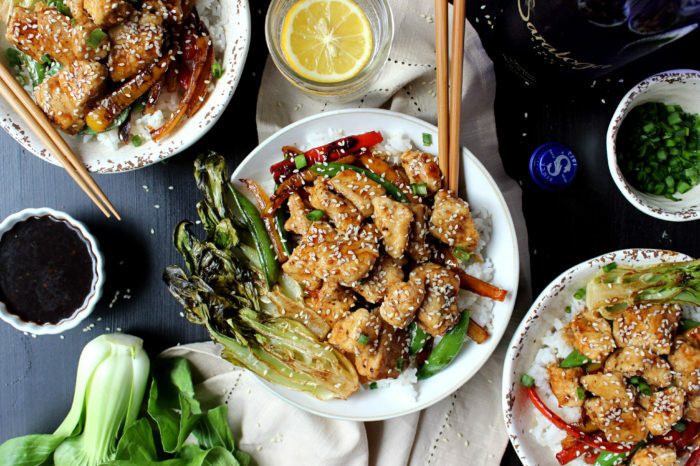 You get started by whipping up a honey hoisin sauce made of hoisin, honey, and garlic. The taste is all sorts of addicting – savory, sweet, tangy! 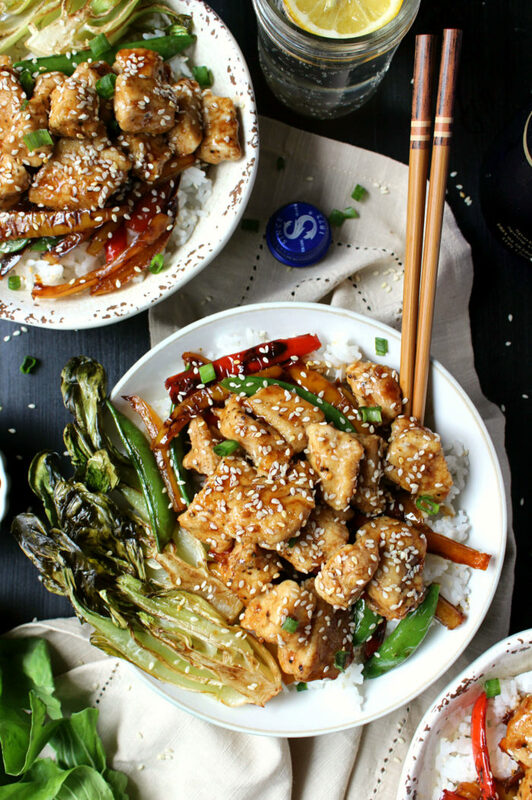 – making it absolutely perfect for a stir-fry. Once the sauce is prepped it’s time to cook the chicken, which takes all of five minutes. 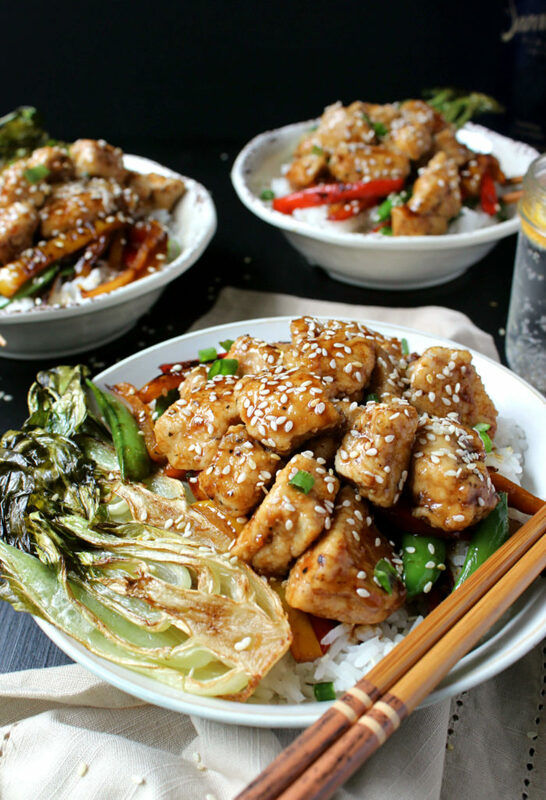 The cooking process is the same as my Chinese orange chicken – dice boneless/skinless chicken breasts, coat, sauté – but instead of using flour this go-around, I used cornstarch. Doing so not only renders a crispier chicken (yes! ), it also makes this gluten-free! I know how you love to be trendy. After the chicken is cooked it’s time to tackle the veggies. First sear halved baby bok choy in sesame oil – so cute! – then begin working on the peppers. 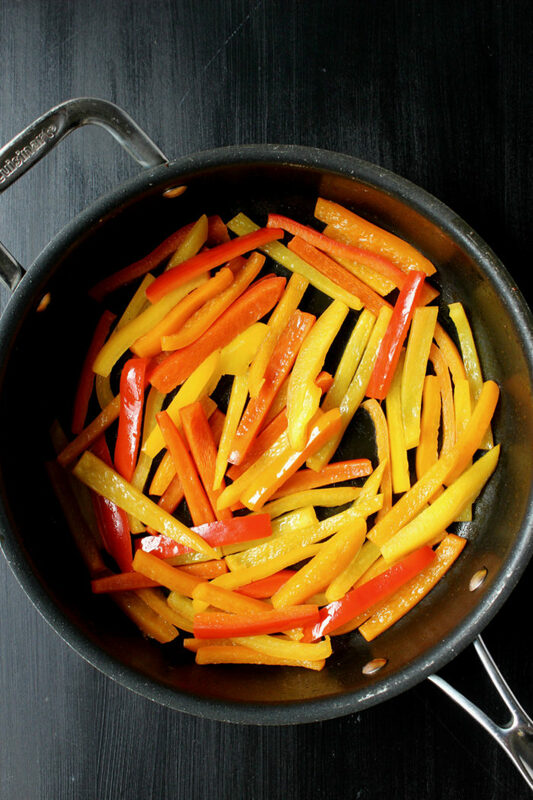 The key with stir-fry’s is to achieve SIZZLE, regardless of whether you own a wok. So even if you own the shittiest, crappiest, saddest little excuse for a skillet, you can get this recipe right. Simply lather your piece of junk in a little extra sesame oil, then heat over a high flame until it practically smokes. Once it’s there, start stir frying. As the peppers begin to char add some honey hoisin sauce to the skillet while maintaining a high flame. 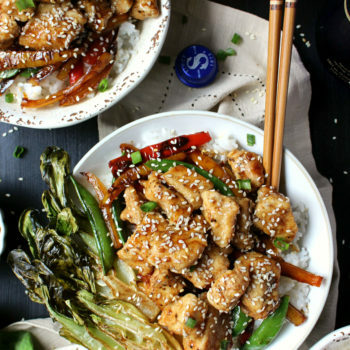 Doing so allows the sauce to reduce and caramelize into a traditional stir-fry glaze that’s utterly sumptuous, you’re seriously going to freak. From there lastly stir in the sugar snap peas for 1 – 2 minutes, then build your bowls! Begin by preparing the sauce. In a small mixing bowl combine all sauce ingredients, whisking until well combined. Start with 3 tbsps of honey, then add a fourth if you’d like the sauce a bit sweeter. 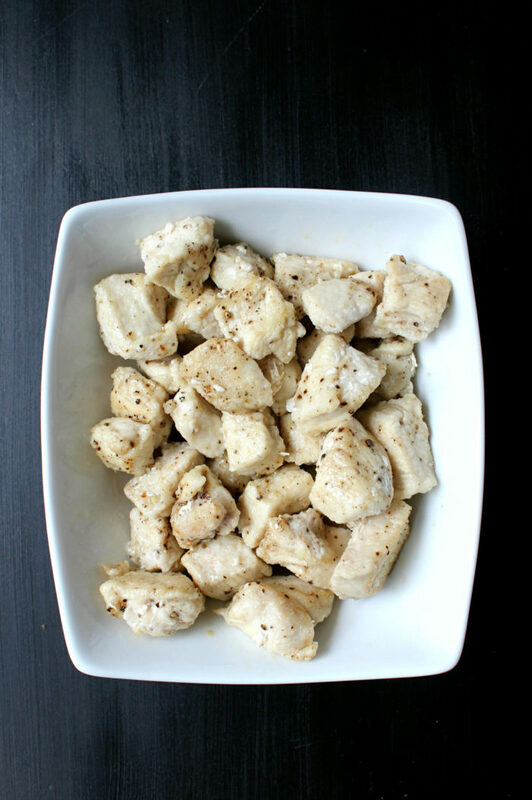 On a cutting board cut the chicken into cubes before transferring to a large mixing bowl. Season with salt and pepper, then combine with the cornstarch, tossing until evenly coated. Heat a large skillet over a medium-high flame. Add 2 tbsps of the sesame oil, swirling to coat the bottom. Arrange the chicken in a single layer, then sear for 2-3 minutes on either side until cooked through. Transfer the cooked chicken to a clean bowl, covering with a dish towel to keep warm. Increase the skillet flame to high. 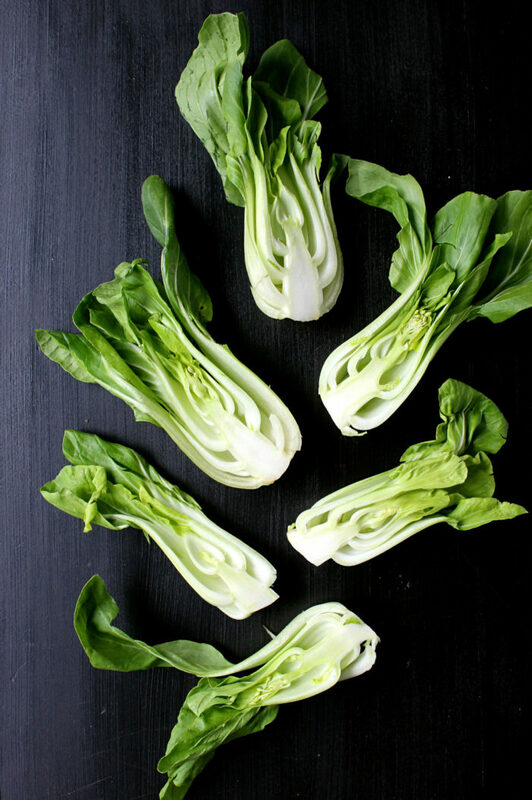 Place the bok choy face-down and sear until crisp, about 5 minutes — Set aside on a clean plate. Add the remaining tablespoon of sesame oil to the skillet, again swirling to coat. Add the peppers and sauté until tender and beginning to blister (about 10 minutes), then add a few tablespoons of the honey hoisin sauce and the sugar snap peas, stirring to combine. Continue to sauté for 5 minutes until the sauce thickens and the vegetables begin to caramelize. 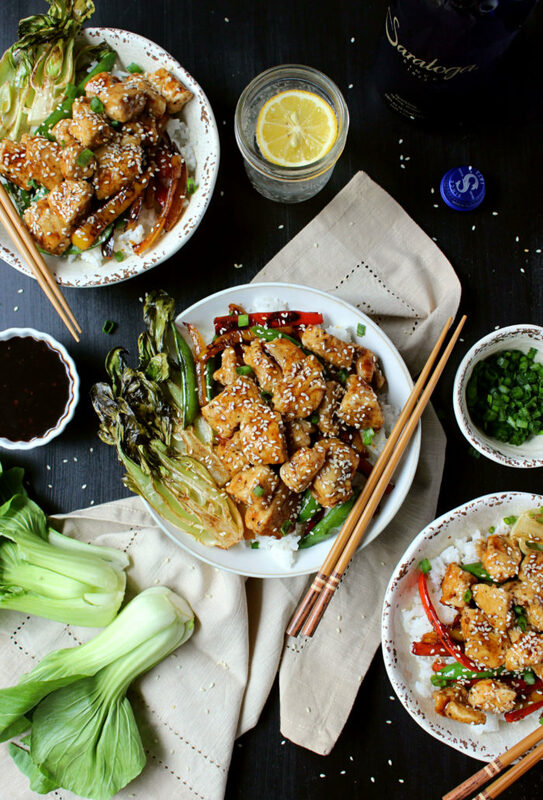 Toss the chicken in the remaining honey hoisin sauce, then build a bowl with rice, vegetables, and chicken. 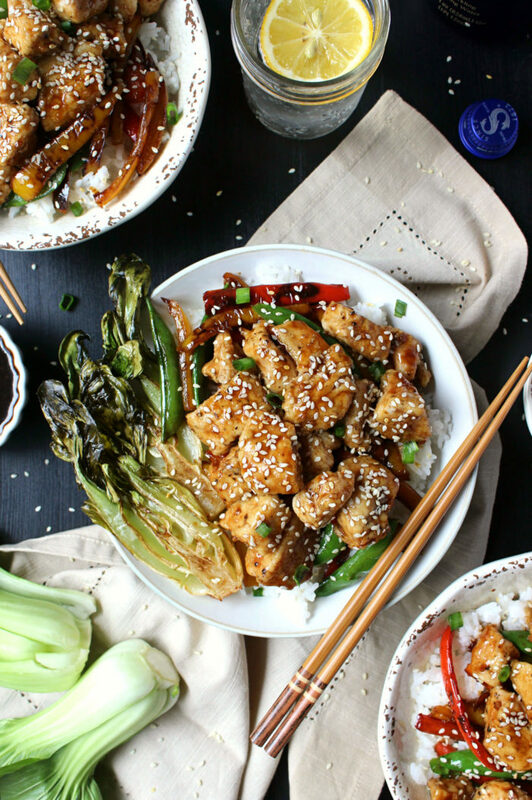 Garnish with scallions and sesame seeds, then immediately eat.